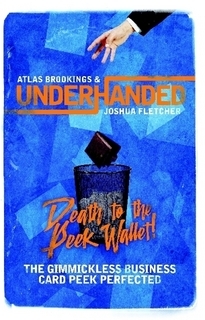 Underhanded is honestly the easiest, cleanest, most direct piece of peekery out there. It gives you a full business card peek, is easy to do, requires no gimmicks, and is just plain, full blown awesome super best number one! No nonsense, this thing is a beast, a straightforward, low tech workhorse that gives people a reason to hang on to your business cards. And there is nothing to find. You are so clean, it looks like you work for the CDC... ummm... because I'd expect those guys to be pretty fastidious about cleanliness. I could be totally wrong though and that analogy doesn't track. But I think it does? Doesn't it? Apart from teaching the "Underhanded" method, this book comes with a number of routines, each truly refined through performance at numerous gigs. In fact, the book contains my drawing dupe, Epic Triple Fail, that isn't really a dupe but is probably one of the most powerful reveals I use (really, it makes the ladies hyperventilate... something I've always wanted to be able to say, but I mean it - they are frequently so unexpectedly and suddenly stunned that they forget to breathe and you get that sudden intake of breath and unrepeatable stream of sailor speak), as well as the Epic Q and A - a fantastic mind reading Q and A with three people that leaves EVERYONE floored. Why buy expensive electronics or peek wallets? Use a low tech method that is truly Underhanded. 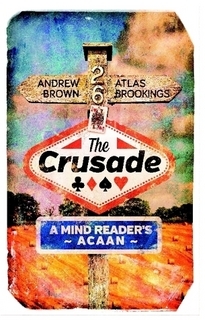 When Andrew Brown and Atlas Brookings released The Crusade in 2013, it was to wide spread acclaim, loved by both reviewers and performers all over the world and hailed as an instant classic, with over 1,000 copies sold to date! An Impossible Thought of Card at a Thought of Number effect, reminiscent of The Crusade both in presentation and impact, but which ONLY requires a single participant. Doctor Jones uses tried and tested principles to which have been added subtleties in technique and presentation which have been refined and honed through countless real world performances. This is a self contained effect, unique in methodology, and does not require knowledge of The Crusade in order to perform. As with The Crusade, Doctor Jones can be performed with a borrowed, shuffled deck, and requires no sleight of hand whatsoever. Moreover, Doctor Jones requires only one participant, allows them to freely choose their number, and ensures that the performer never knows the quantity or contents of the packet used. The Intrepid Rogue's Manual of Deception is a new book by performing mentalist Atlas Brookings and represents his first major work since Train Tracking. The Manual of Deception is 224 pages long and comprises 8 essays, one switch technique, and 14 effects. While he is known for his propless work, the majority of the material within encompasses some of his work with props. The Hollywood Squares prop also ships with the book. This essay asks you to take a closer look at your goals within mentalism, encouraging you to use your analytical skills to determine who is best positioned to help you to achieve those goals as you select the path you'd like to follow. It offers a system for cutting through the hype and nonsense that so often surrounds creators and releases and outlines what I think are the four archetypes that we most often see within this subculture. A propless effect that can be used with a single participant or a crowd of hundreds, people are asked to think of random bits of information which are subsequently easily revealed. This can be played either as mind reading or influence and is a powerful technique that is always available to you. An incredibly simple and deceptive, self-contained one handed billet switch in which the hand not in use never leaves the pocket. An essay that asks you why you are drawn to mentalism and examines the implications for success that your answer may have. A compelling three phase routine in which three words are freely chosen by a participant, two from a list and the third an entirely free choice - yet their words are the only words spelled out in a deck of alphabet cards. Formerly the Subtle Hustle (I was informed that this name was already in use elsewhere). An easy and propless means of winning or losing (your choice) at Rock, Paper, Scissors. An essay that encourages the performer to consider how their performance is perceived by the audience, asking whether it is best to simplify and streamline presentations, and how to approach such a problem. An example of the principles above put into practice, High Five is a close up effect using five numbered business cards. The participant selects a card at random for both the performer and themselves, and their choices are predicted, as is the five digit number that they create. An impromptu and propless murder mystery game in which the performer becomes a human lie detector and hunts the elusive killer. A wonderful routine that involves an apparently innocent, yet gimmicked business card (supplied with the book) and which allows the performer to determine what different celebrities up to three participants choose to think of. An essay that emphasizes the importance of developing and improving problem solving skills, complete with an example from my personal working repertoire that allows dual reality to be performed in audiences of any size, including those that know one another well and corporate audiences - all without any of the drawbacks typically associated with the method. A hands off effect in which the performer gets the participant to randomly think of a number, deal out playing cards onto the table, remember the card at their number, and reveal that card with ease. A game is played revolving around honesty and Wall Street. Envelopes containing stock picks made by anonymous 'whistleblowers' are laid down before four participants who are then given a free choice of stocks to invest in. After three days of trading, the proceedings are called to a halt as the Securities and Exchance Commission (or FCO in the UK) arrests all four participants for insider trading, and the prediction envelopes are opened, proving that in each case the anonymous whistleblower's information was correct. An essay that examines the formula for finding the most direct route to accomplishing your effects, both in script and actions, and whose intended aim is to help you remove dead time from your show, allowing you to establish and keep the pace moving. An essay dealing with the benefits of learning to adapt a presentation to be able to memorably convey a bespoke message. Contained within the above essay, the workings of this Blackpool effect (filmed back in 2014) are explained along with the history and reasons behind embedding a message into an effect. A pseudo hypnosis effect in which a participant , apparently in a trance state, is able to select the match to a playing card chosen by another despite nobody - including the performer - knowing the identity of the card. Moreover, when shown the faces of the rest of the deck, they are blank to this participant despite them being clearly visible to the audience. A single person version of the above effect, with an influence theme and a prediction tabled before the card is even selected - and the participant selects from a face up fanned pack in which each card is demonstrably different. A casual, conversational personality reading that ends with the performer revealing the day, month, and year of the participant's birth - despite apparently none of this information being communicated to the performer. The most common feedback I hear about this effect is that it is better than Isabella's Star, which is no small compliment indeed. An essay that deals with what is, in my opinion, the right way and the wrong way to contribute your ideas to the mentalism community, along with a marketing guideline for those seeking to establish and manage their brand. A companion to my "think of a super hero" plot, along with the two person presentation that makes this such an entertaining piece for the set of friends you are working with. An incredibly simple billet technique that can be applied to nearly any billet routine, a load, switch, and peek that is invisible in which you hands are shown clean throughout and you never go to your pockets. This is my go to move when performing a Q and A routine. A final word of advice to those who would like to chase their dreams and live life on their own terms. It is entirely possible, but you HAVE to know this one thing - and you have to take it to heart. 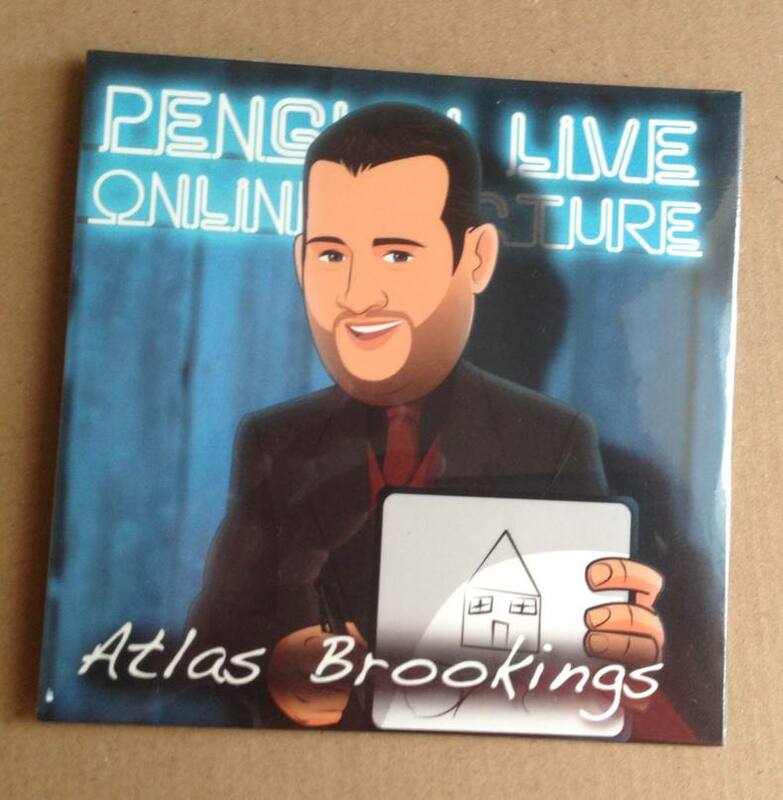 OWN THE BEST REVIEWED PENGUIN LECTURE OF 2015! Join Atlas as he examines the strengths and limitations associated with propless mentalism techniques. He'll discuss when to go propless, the correct way to present the material, and how to handle those situations when things don't go exactly as you'd planned - teaching you the right and wrong way to fail when using these approaches. Tune in and discover how to do some amazing things when you have only your wits about you. CloudNine - A short personality reading that finishes with telling someone the day, month, and year they were born. Comicle - Tell someone the name of the superhero they are thinking of. Disney Dynamite - Name the animated Disney film you participant has in mind. Forward Thinking - You play an association game wherein your participant only answers in their mind and selects only one of the responses they freely thought of. You then reveal their thoughts. Imbalanced - An impromptu murder mystery game, wherein you not only name the murderer, but you reveal whether someone chose to be honest or to attempt to deceive you. Speed Trap - Within moments of meeting someone, tell them the make and color of the car they have in their garage at home. Quinnfluence - A series of free choices lead three participants to three random thoughts, which are then promptly revealed. There are some pretty cool things that you can do with a memorized deck. The only trouble is that you have to memorize 52 cards in 52 positions. Not only can that prove challenging, but it is incredibly time consuming and requires constant work to move that information from your short term to your long term memory. Understandably, not many people make the effort. But what if you could memorize the position of every card in a deck in a matter of minutes - And then recall that deck order for the rest of your life? This ability adds a versatility to your card repertoire that is WORTH having. How is this possible? Why does this work? Memorized decks typically take a number of forms, and (unsurprisingly) each has some sort of compromise. A deck that requires you to memorize it through brute force takes an awful lot of time to master. A deck formed from a set of rules or a formula typically can't be freely handled or displayed as the cards don't look mixed. Systems that allow the use of memory pegs are also difficult to learn as you often have to learn the peg system as well. In an ideal world, there wouldn't be any compromise - You'd be able to quickly memorize a deck that could also be freely displayed and handled by a participant. You'd have your cake and eat it too. I'm pleased to say that this is now possible with 'The Solution'. 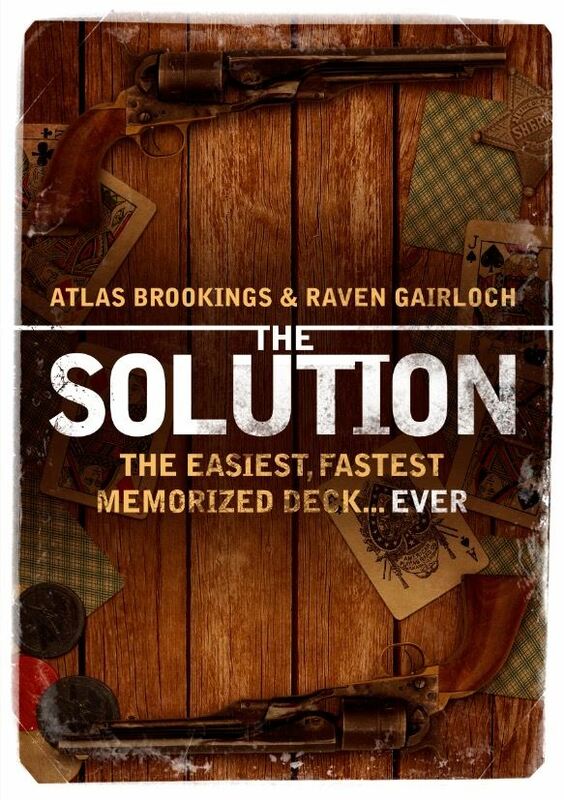 The Solution is the deck that I referenced during my Penguin Live Lecture - a deck that you can memorize in minutes and openly fan and display. The book - running to 120 pages - not only outlines the system, but also comes with several routines that have been created specifically for someone who wants to perform as a mind reader. "Most of us have seen those shows on television where someone takes something to a flea market or rummage sale only to have an expert in possession of a trained eye come along and see through all the age, dust and patina that comes with neglect to discover a hidden gem, a priceless and coveted item. All too often in Mentalism, a method is not what we expected or wanted it to be. As a result of our perceptions, we walk away and leave it behind. Over time, it is forgotten and gathers dust until one day, some expert comes along and shows us just how amazing this little item truly could be if it was polished and lovingly repaired rather than cast aside, scorned and esteemed as naught. Only then is our true appreciation won. The Prodigal was written with the sole intention of demonstrating the value of one misunderstood and much maligned method, and offers glimpses of masterworks that can be built with it. It offers a true demonstration of pure mental powers - void of pencils, scraps of paper, envelopes, gimmicks, or any of the accompanying apparatus that walk hand-in-hand with other effects and immediately serve to trigger skeptical reactions in our audiences - suspicious that they are being deceived, just unsure as to how. The Prodigal examines the method by which you can create pure, direct mind reading - miracles that can be performed whilst in a straight jacket, with no props at all if you so choose. The Prodigal offers you strong, convincing Mentalism in its purest form. 155 pages long, this softbound book offers up a number of strong close-up and stage-worthy mind reads, bolsters performance material based on psychological forces, offers methods of performing impressive ungaffed book tests, and outlines a means by which actions taken in radio studios or corporate headquarters hundreds of miles away can be accurately revealed. Better than all this - it establishes a creative platform upon which you can expand and create your own distinctive feats!" What do other Mentalists think? "Atlas has taken a field which many have often shied away from and given it a new lease of life. He has given this technique a massive kick up the backside and offered you, the performer, a very real variety of modern genres from which you will be able to reveal specific thoughts. His tips and suggestions for how to make this convincing are wonderfully direct and you will feel very confident, upon completing this book (although, I want to say that it's more like a workbook due to the wonderful layout he's decided on) that you will be able to perform some pretty strong and more often than not, impromptu, Mentalism." This has a huge amount of information to digest, but it's 100% workable, and Atlas has brought many, many new ways to work with this to the table. I think that many don't use this principle simply because a work this all encompassing has never before been written on the topic. This really fills a previously gaping hole in mentalism and opens up many doors. This is incredibly underpriced in my opinion. I rarely get to say this in reviews, but this is a solid 10/10." "Good stuff...well worth the attention of many mentalists. Very thorough coverage and history of this method. Congratulations. l love what you have to say about this method and technique." "The first thing you should appreciate reading this is the amount of work and thought that has been put into this product. This is not a cut and shut job like some products that are being released presently...If you want a better understanding of this area of mentalism grab this while you still can, this book will open new doors and windows for your thinking. Great work Atlas! Great book, great thinking, great price! Grab it see what all the fuss is about." "This is a fantastic read. I must admit this pdf takes a very old method and gives it a good shake down. I have always avoided using this sort of thing in my act. I've never been comfortable with working it. Having read over this very fine piece from Atlas I must confess, I am a convert. The 90 paged pdf is crammed full of information, explanations, examples and ideas. This work was not hurriedly thrown together, it is immediately obvious that a lot of time and care and effort has taken place to bring this release to fruition. I am impressed. I will be reading this over a good few times to give this method the respect it is due. Many of you will be familiar with the method but I imagine even those that already use it will learn from this in depth exploration. Well done Atlas, you have certainly changed my perception and attitude towards this chestnut of mentalism. This is a must have!" "This is some great new thinking and fits really well with 'Naked Mentalism' and the whole approach of getting as close to the real thing as possible. A very accomplished release indeed." "Overall, my initial impressions are 'thank god, someone has needed to write this for a long time' and that the material provided is real world and incredibly workable. Great job Atlas." "The Prodigal is an essential for any serious mentalist's library, or anyone wanting to finally learn how to use one of the most misunderstood, yet unquestionably powerful techniques in mentalism." "Atlas has done for this principle, what Docc Hilford and Max Maven did for magicians choice. IMHO. Well written. No fluff. Good stuff." "This is, quite simply, excellent. I've always love the idea of what is presented in this manuscript, but never thought it a viable tool to work with. Atlas has done an excellent job breaking down each and every step of the process, making it a very workable endeavor. Yes, you'll need to work with it, and practice, like all things. But after reading The Prodigal, for the first time I'm actually excited to put in the work. I can't wait to further develop this and incorporate it into other routines. The effects and systems included are an excellent, excellent value, and is enough to get anyone started right off the bat. But for me, the real value lies in obtaining a very precise manual on how to master the art of a very undervalued principle in mentalism...This is one of the best purchases I've made this year, in terms of furthering the knowledge of my craft." This is without a doubt the best source of info out there on the subject. Truly brilliant thinking and I am struggling to decide what/how to adopt or adapt as The Prodigal is an embarrassment of riches!" "Atlas Brookings is a thoughtful creator who has compiled a detailed and thorough resource for anyone who is looking to deceptively and entertainingly use branching anagrams. 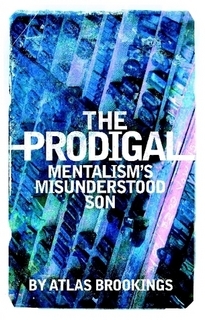 The Prodigal is a joy to read, and I think that will be the case even for those who do not call themselves mentalists. Brookings' dedicated research into this method is inspiring. Such a passion for study and improvement should be something we all aspire to." When this routine was first released in the Pyscrets publication 'Liber Mentis', it created quite a stir. It offered a means of performing both a lie detector type routine as well as an incredibly clean and direct mind read, devoid of any standard form of method. At the time, the text was only available through the Psycrets publication, but, after the widespread approval it received, the text has been reworked and dramatically extended, offering 22 more pages of additional material. This new material not only contains another means of performing a clean, impromptu, and apparently impossible mindread, but it contains instructions for a book test that is unlike anything you have ever seen before! Imagine being able to have someone choose a word from a book, close the book and set it aside, and then change their word to any other word they can think of (and I'm not talking about a different word from the book, but any other word they can think of) - only to have the performer subsequently reveal their new word with NO fishing! For the first time, this extended version of 'The Real Thing' teaches you how to do this and much more! Released publicly through this site for the first time, this text contains an astonishing array of impromptu routines! Any time you are asked to perform a feat of mind reading, all you need is a pen and something to write on. On five (or more) different pieces of paper (business cards work well) you write a unique sentence, folding each card as you finish. The participant takes all five pieces of paper, and while you turn around (or leave the room), opens one and reads it. Once this is done, the Mentalist has a short chat with the spectator, and then tells them the sentence they were thinking of. The papers stay in the participant's possession the entire time. No peeking, no confederates, no dirty work - Just REAL psychological Mentalism. "At last a routine where you really are doing what you claim! This is a fantastic concept that Atlas has expanded greatly. It has the feeling of real mentalism because it IS real mentalism." "Page seven of your manuscript is worth whatever you end up charging for it." 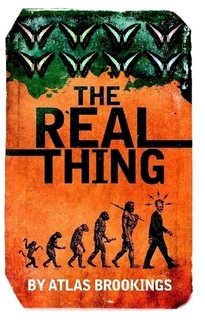 "I really enjoyed 'The Real Thing'...The core of the effect uses pure psychology which is just the ticket. The way in which this has been used to create a nice little lie-detector routine is very clever indeed." "Rather than a physical peek, your method is kinda like a mental peek!" "I must say I really enjoyed reading 'The Real Thing'. If nothing else, it has gotten me thinking and that's when I know I'm taken by an idea." "Thank you for making my copy of 'Naked Mentalism' relevant again!" "Atlas has open up a world of possibilities here. Using this knowledge you can play mind detective and catch your criminal every time. Very sneaky stuff. Excellent." "When I first released Naked Mentalism back in 2007, I hoped that others would run with it and create simple, subtle, yet powerful effects that really do feel real. With 'The Real Thing', Atlas has certainly done that. It's a tour de force; intelligent, clean and yet very reliable. Lovely work." And all of the above feedback was given BEFORE the additions to the text! "Is it really possible to read minds? After reading this e-book I believe I can, at least that's how I felt. Inspired by Jon Thomspons Naked Mentalism, Atlas has taken the method to another level. I have been doing this and it really works, so it's not some pipe dream. It is very easy to understand and this book is well written so you don't have to be afraid of psychological thinking. I couldn't wait to try it out on friends after reading and it blew them away. The great thing is once you have learnt this you'll have some incredibly powerful impromptu mentalism that will fool people badly. The method can also be applied to a book test. There is a gimmick book involved which is described how to make, or you can order one online from the author. I would probably just order one because it's not expensive and save yourself a lot of time and trouble. I would say it's easily one of the strongest book tests I've seen in some time. For close-up performances there is a great routine with business cards using the method. You can perform this on one person or several. There are a lot of variations explained in this e-book. It's the method that really impressed me because I hadn't come across it before, and my mind was alive with ideas on how to apply to other effects. Have a look at the video below to see exactly what you can accomplish using the Real Thing! This softbound book is 84 pages long and offers a means of entering the human mind unlike anything you've ever seen before! It gives you the chance to perform the REAL thing! THIS IS AN ENGLISH ONLY EFFECT! 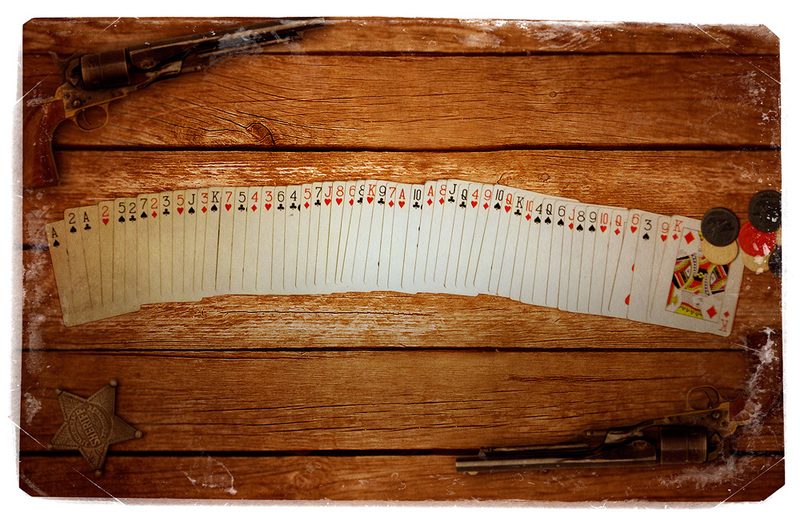 The cards rest on the table in front of your first participant, who gingerly takes them up and begins to count down to his secret number - a number that has never been written down, verbalized, or communicated to any other person. He slides the card across to the young lady next to him. Her thoughts have been focused on an image - a suit and a value. Again, her choice of card has never been shared. It has never been withdrawn from the pack, never touched and certainly not forced. 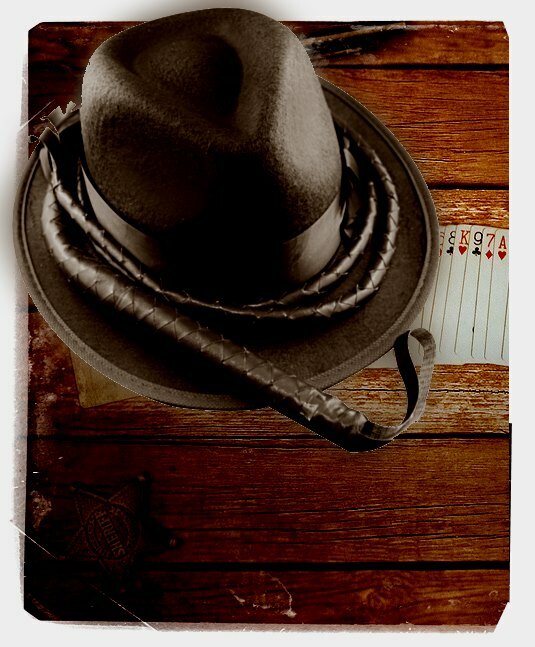 Her hand drifts toward the card on the table. The one separated just now by her boyfriend from the rest of the pack. The one resting at the number that he was merely thinking of. Why is this called 'The Crusade: A Mind Reader's ACAAN'? To many in the magic industry and to card magic enthusiasts especially, the 'Any Card At Any Number' plot is a cherished and well-loved miracle. It's perfect execution is so highly prized and sought after that it is popularly referred to among card enthusiasts as the 'Holy Grail'. For some, their appreciation for the effect is akin to that of a fine wine and their devotion to it never wavers. So, in the title 'The Crusade', you have a reminder that what you are presenting is about the journey and not the mythical Holy Grail that is at the end of it. This moment of meeting is what 'The Crusade' allows you to create. When the card that one person only thought of intersects at the number another person only thought of - the journey that you created for each of them becomes the destination, and an experience is formed that will create a sense of amazement whose memory will never fade. This softbound book is 109 pages long and offers an opportunity to astound your audience with an impossible and satisfying piece of mind reading!